A question you often ask us is whether Solar Power will work for you? The answer is that the majority of homes we come across are able to have Solar Power installed. So we’re confident that your home will be suitable for Solar too! Of course every home and circumstance is different, which is why we provide a FREE Solar Consultation service to establish whether your home is suitable for solar. And of course what size system and system components can be installed depending on your requirement and budget. Halcol Energy are experts in the supply and fit of premium quality Photovoltaic Solar Systems to homes throughout Queensland. Our mission is to provide you with a high tech Solar Power System solution to help you beat ever rising energy costs! Electricity prices in all Australian states are continuing to rise and the increases show no sign of slowing! The future is promising even higher prices for carbon-based energy as we search for clean, renewable alternatives. So finding out free of charge whether your home is suitable for a Halcol Solar Power System is a no brainer! Photovoltaic Solar Power works by converting daylight from the Sun into electricity. This electricity can then be used to power your homes electricity needs. It can also be used to export electricity back into the electricity grid when it’s not needed by your home. The best bit about this is that your Solar Power System is literally making you money. Solar Power works by converting sunlight (daylight) from the sun into electricity. We install Solar Panels on your roof which generate Direct Current (DC) Electricity. 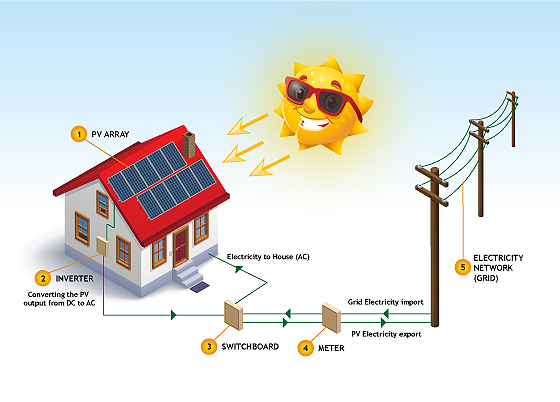 This electricity is fed into the Inverter we install which convert the DC electricity from you Solar Panels in Alternating Current (AC) Electricity. Your Electricity Retailer such as Energex, Ergon, AGL and Origin etc will install a bi-directional meter go connect you to the grid. This meter then reads and reports on both any incoming electricity you still require and the outgoing electricity you’ll export to the grid. Your power bills then take into account the lower amounts of electricity you’ll need from the grid (if any) due to your Solar Power System. And credit you for the electricity that you export back into the grid when your home does not need the electricity. This happens automatically, so you won’t need to switch between the solar electricity generated by your system or electricity you may need from the grid. You won’t need to switch it on in the morning or off during the night either. The systems does this seamlessly so that you don’t have too, basically you won’t notice any changes to how your home or the appliances within your home function… just a significant reduction in your power bill! The Solar Panels will more often that not be mounted on your homes roof. In partnership with the Sun Solar Panels are a reliable way of producing green renewable energy without any noise or air pollution affecting the environment. For Solar Panels to work efficiently they need to be placed where they have clear and unobstructed access to the sun rays. In Australia the sun is always in the Northern sky and the suns angle changes fro higher axis in the summer to a lower axis in the winter. Ideally we’d place your Solar panels on a North facing angled roof, but West facing roofs can also be used so we’ve got options for your home. An inverter changing the solar DC power into 240V alternating current (AC) suitable for yourhousehold appliances and feeding into the grid. Your home uses electricity firstly from the solar PV modules with additional demand supplied from the grid. A meter measuring your electricity production and consumption. Any excess is ‘exported’ to the electricity grid. Flat roofs are great places to place you Solar Panels also known as Photovoltaic (PV) Modules as they can be mounted on a frame tilted to the optimal angle to catch the suns rays. The Solar Panels can also be placed on a pitched roof and Halcol have extensive experience on mounting on all roof types such as tin, tile and shingle roofs. If you roof is not suitable don’t worry as there’s still a possibility we can ground mount your PV Modules to power your home. For optimal results from your Solar Panels they must have a clear path to the sun during daylight hours. Any line of sight obstructions between the sun and your Solar Panels such as trees and other buildings during daylight hours is know as shading. Shading may substantially reduce the amount of electricity that you system can produce so these are very important factors to consider from outset. Your Solar Inverter will typically be places in your garage or another suitable spot. The type of Inverter used with your system is important dependent upon your requirement as for example if in future you want to add more panels to you system you’ll need an Inverter that can handle expanding your Solar Power System. Most Solar inverters will tell you information such as the amount of electricity your producing at that point in time, how much electricity you’ve produced during that day and the total of electricity you’ve produced since your Solar Power System has been in operation. Many premium quality Inverters now also feature Wireless Connectivity allowing you to access and monitor your Solar Power Systems performance online via your desktop, phone or tablet… so you can check how your systems performing wherever you can connect to the Internet. Halcol are experts in the design, supply and Installation of premium quality Solar Power Systems. We’ll make Solar easy for you to understand and install. So yes Solar Energy will work for you as it does for so many people already in Australia. The majority of people we’ve installed a Solar Power System for see a significant reduction in the amount of electricity required from their utility company along with enjoying a significant reduction in their power bill. You too can beat the soaring price of electricity now by installing a Halcol Solar Energy System and make your home pay its own way in partnership with the sun!